Is there anyone who has never heard of Hello Kitty? Created by Yuko Shimizu for Sanrio Co., Ltd., Hello Kitty is one of the most famous fictional Japanese characters. If you are visiting Japan this summer, you will have the unique opportunity to have a long and personal travel experience with Hello Kitty. For three months starting on 30 June, the Hello Kitty Shinkansen will be operating between Hakata and Shin-Osaka stations. Buyinjapan is located in Yamaguchi, so we can take this train from Shin-Yamaguchi station in either the Hakata or Shin-Osaka direction. The train is fully decorated with Hello Kitty motifs. Illustrated pink ribbons connect all eight cars, and there is also a Hello Kitty design on each car. The first car of the train is called Hello! Plaza. Here, there is a shop where you can buy Hello Kitty items and snacks and also sit and relax and enjoy the view outside. There is also a special theatre introducing the places where the train travels: Fukuoka, Yamaguchi, Hiroshima, Okayama, Hyogo and Osaka. You can also take a picture to preserve your memories in the photo spot corner. 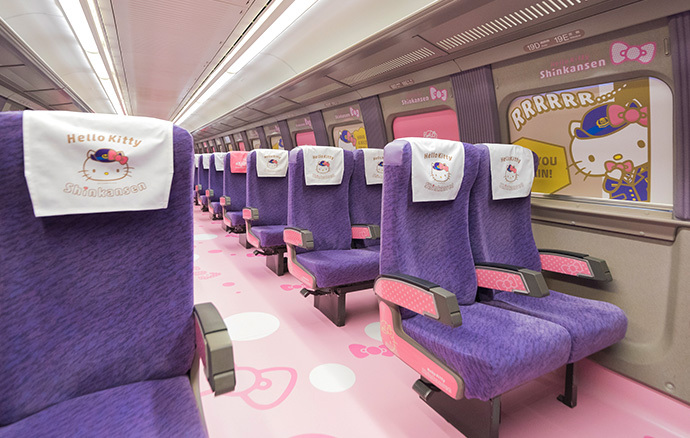 The second car is a non-reserved seat car called the “Kawaii Room!” where anyone can sit on a first come, first served basis. The seats, windows and floor are lavishly decorated with Hello Kitty. 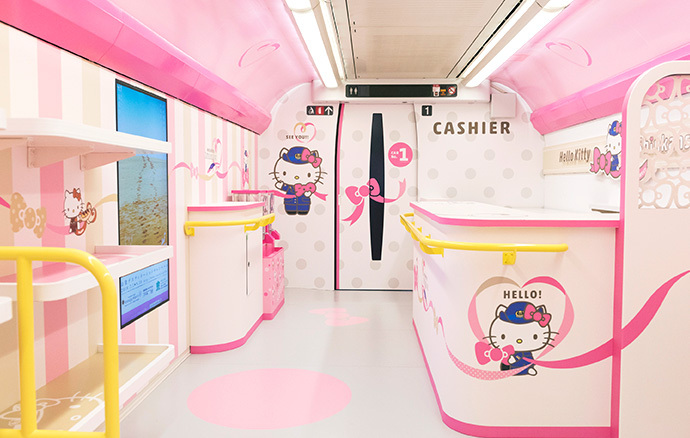 There’s no extra cost for getting on the Hello Kitty bullet train. (You will have to pay extra for reserved seats, however). If you go to Hakata station, you can buy merchandise at special shop called Hello Kitty Shinkansen Marche. They sell a variety of items, for example towels, socks, pens or keychains. In addition, you can find regionally limited Hello Kitty items everywhere in Japan. For example, there are 47 prefectures in Japan, so you can find Hello Kitty items related to each prefecture. On the internet, you can find virtually any type of product with an image of Hello Kitty on it. Do you want to order a school bag or robot vacuum?